GET YOUR PINOT ON, PERTH! Here is your wine list for Pinot Palooza 2018 and boy, is it a beauty! 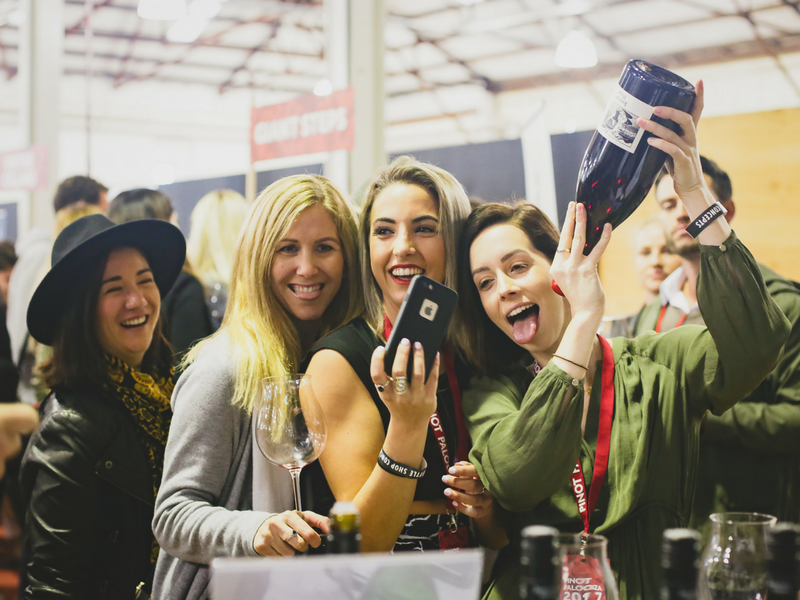 An incredible range of styles, regions and producers are represented this year… you lucky things! But so many wines on tasting can be somewhat overwhelming, and the ultimate question is always where to begin? Our suggestion is to approach it as you would a music festival. Think of the different styles or producers as stages, each one representing a certain genre of music or musician. Each will have its own unique character and what you like or don’t like is all down to how you feel or what you feel like seeking at that particular moment in time. Spend time at the Main Stage, of course, but make sure you head to the Fringe and Emerging Stages for something new or different. Up for a splurge? Hit the VIP stage. Up for something fun? The Dance Tent’s where it’s at. And when you feel like taking it a little easy, the Chill Out Room’s waiting for you. This is how you Pinot, with your hands in the air like you just don’t care! Main Stage: Think of this as the headline act which you absolutely have to check out. If you haven’t heard of them, you soon will. This one’s a must. VIP: This is the one you’ll cough up good dollars for! Fringe: A little left field, a tad alternative, unique, intriguing and captivating. Not mainstream and all the better for it. Emerging Talent: This is your new, up and coming Pinot artist, or one who’s undergone reinvention. Chill Out Room: Super chilled, easy going, relaxed and super lo-fi. Dance Tent: Something that is just bright, fun, and makes you want to move. HINT: We’re all about supporting local talent so make sure you head to the Pemberton stands to check out these legends. Then, make a beeline to the regional stands such as Gippsland which is full of emerging artists, or the Adelaide Hills (for some wild times) and Mornington Peninsula for the true classics. Then perhaps check out some of last year’s People’s Choice TOP 10 (there are a few here) but make sure you spend time with someone new, too. And finally, don’t forget to VOTE FOR YOUR FAVOURITE wine on the day to go in the draw to win some epic prizes.